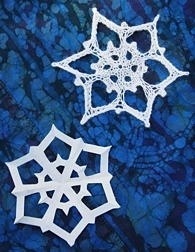 I’m having a knitalong on Ravelry this month for my Paper Snowflake pattern – please join me! I love cutting paper snowflakes, with twelve folds and six symmetrical points. This knitted snowflake looks very much like one of my paper ones. Knit these from the center out in cotton, linen, or hemp and then starch to use as ornaments. Knit in any fiber and use as appliqués. Good for using up leftovers from other projects. For experienced or confident knitters. None of the techniques used are particularly difficult on their own, but the combination of some of them is a little finicky. I’m going to be knitting several as holiday decorations, and will be starching something for the first time, as much so I’ll know how as anything else. A full chart and written instructions are both available. You could easily use Magic Loop or 2 circulars; I used double-points. The pattern is needle agnostic. < Round to flat, flat to round, part 3.